MOSCOW, Feb. 13, 2019 /PRNewswire/ -- LiveMe, the number one live broadcasting app in the US, today announced it has reached major growth milestones in Russia, as well as surrounding countries in Eastern Europe. LiveMe's continued momentum in overseas markets reflects its commitment to being a global platform that lets anybodyâ�”anywhereâ�”share their talents and passions with people of all cultures and backgrounds. Since launching in 2016, the app has amassed more than 84 million users in over 85 countries and region. Russia and the surrounding region are now home to more than 200 LiveMe broadcasters who are using the app to showcase their talents and build authentic connections with like-minded people on a global scale. As an ongoing investment in the success of its newest market, LiveMe has appointed a dedicated local team, including talent managers, scouts, and other resources to recru! it and de velop new talent. LiveMe will also tap into the region's existing talent pool and creator community to further guide and support their professional growth. "Eastern Europe has a lot of untapped potential that can help bolster the already diverse LiveMe community. We've come across many talented young people who share a global mindset, so we are investing a lot of resources in developing this region," said Mango Du, LiveMe's Head of Eastern Europe and a frequent broadcaster who has nearly 10,000 followers herself. "Having already experienced success in the US and Asia, we know this region can forge the next group of future stars who will bring joy and entertainment to people all over the world." 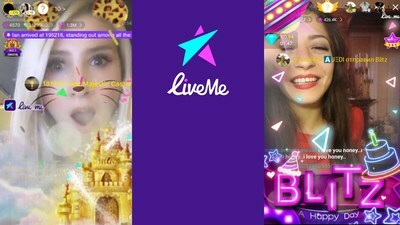 Many of the region's early users were drawn to LiveMe because there were no local platforms available that provided a digital stage for creators to showcase their talents and build a fan following. Models, dancers, students, and other young creative talents all flocked to LiveMe and were quickly embraced by LiveMe's global community. LiveMe also enables independent creators from all walks of life to earn significant income through the app's virtual gifting economy, which has generated many millions of dollars in revenue for broadcasters. The top broadcasters in Russia and the surrounding region who create high-quality content and engage in positive interactions with their fans have already seen significant financial success, many of them earning more than $10,000 USD per month. "LiveMe has given me a great opportunity to provide for my myself and my children," said Jeanne, a single mother of two and one of Russia's top LiveMe broadcasters. Daenerys, another broadcaster and hairstylist from Ukraine, is using her earnings from the app to fund the opening of her very own hair salon. "LiveMe is a great opportunity for local entrepreneurs to expand their businesses or establish new ones, as well as teach and grow new broadcasters and influencers," continued Du. As LiveMe's newest market, Russia and the Eastern European region join established markets like the US and India, which have amassed large dedicated followings among creators and fans, and fast-growing markets like the Middle East, Brazil, Taiwan, Japan, and many more. LiveMe continues to nurture local communities around the world and provide broadcasters with the tools and resources they need to succeed on a regional as well as a global stage. LiveMe Inc. is the mobile app developer behind the popular live broadcasting platform, LiveMe, and is focused on developing content-based applications for the mobile-first generation. Its flagship app LiveMe has amassed more than 84 million users and distributed millions of dollars to broadcasters through direct virtual gifting.